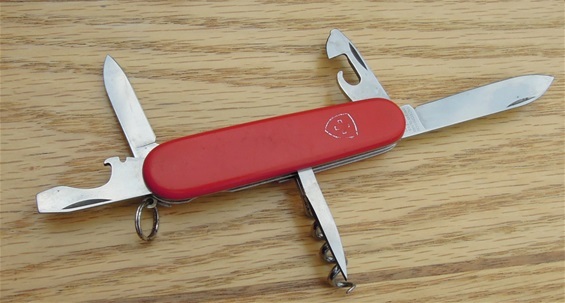 Here is my latest Victorinox economy knife and it got a well known tool configuration. It is interesting because it got the tang stamp from 1980-1987. 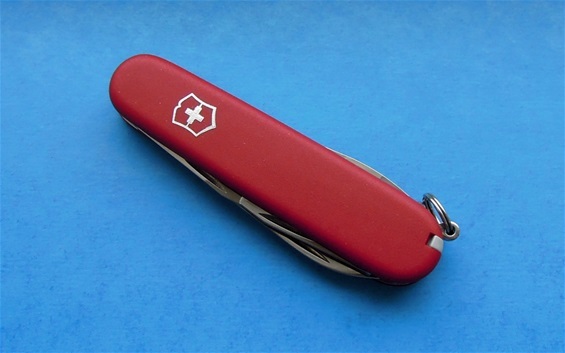 It got the light signal red color and i wonder if this is a knife made by Victorinox for Migros?. It got a hot stamp economy emblem. I like it! I would put this knife to the early 1980s. Here is a very interesting economy or EcoLine knife. It got the Spartan configuration with the number 3.3603. This knife got the tang stamp 2005-2010 but i would believe that you will find this big V stamp up to 2012 or so. I do believe this knife to be from 2008-2011 because of some factors but this is not 100%. What is very interesting is that the emblem is only printed with color and could be a pad print type or similar. It is not embossed or hot stamped into the material. The advertising used on this knife is interesting and this company can be found on the internet. I am glad i got this knife with the box because there are variations here. The advertising used on this knife is also pad printed or just colored in the same fashion as the emblem. This i do believe is used on the advertising and EcoLine knives depending on requests. The number on the box! On the latest depicted embossed cross used on the EcoLine also got the new small v stamp and the box also use a small v in the name. Today was a good day because a shop had a special price with only 99NOK for a 91mm Victorinox Ecoline 3.3603.B. 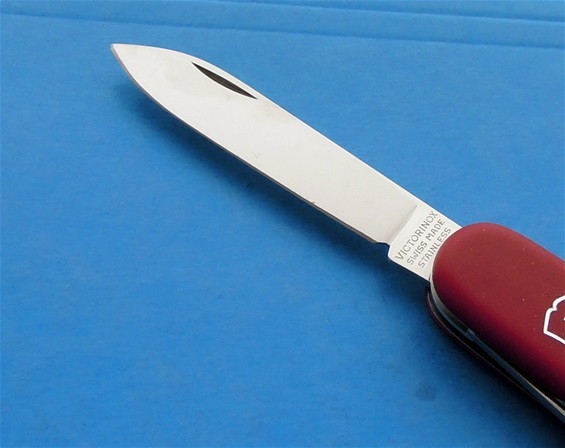 Most people call them a Spartan Ecoline knife and the letter B means it was in a blister pack. I believe this got all the latest changes and modifications done to the Ecoline knives. At least I believe so. It is not possible to beat the price and quality on the Ecoline knives. This knife is a perfected SAK in this category. The emblem in the scale got the depicted lines from the cross; this was done from 2007 on this category. You can still see some grains of silver color from the production outside the embossed or stamped into the scale emblem. I do not have 100% info if it is a hot stamp type emblem but this is not so important because it is down into the material anyhow. The knife edges on this is perfect and razor sharp and there was no need to touch it up at all. All the functions, springs and parts are very nicely polished and the precision is 100%. I recommend looking on this category, you will not be sorry. 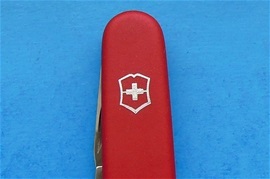 It is the budget models made by Victorinox and Wenger that can give the most interesting details for collectors as well. At least it is so for me. 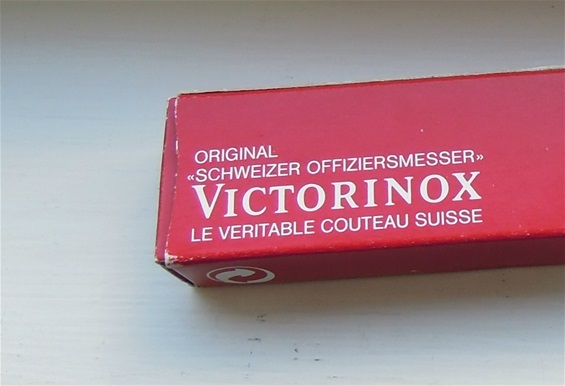 The economy or budget knives made by Victorinox and produced under Elinox 1957-1978, Economy 1979-1999 and todays EcoLine since 2000 does not always follow the mainline evolution. 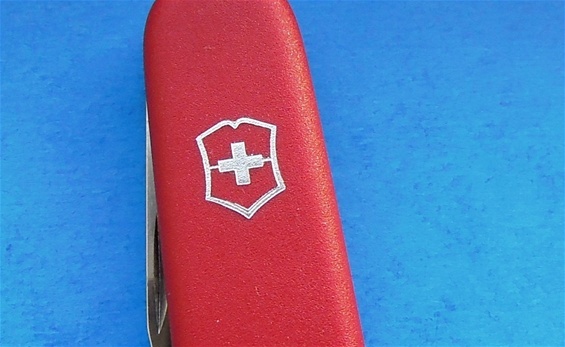 It was first made for the Swiss souvenir trade. P.S Did you know that the Swiss Alps are also famous for spectacular minerals? There is one more interesting evolution detail or maybe a production variation detail as well. The hot stamp emblem are lined up at the bottom on the picture are from 1994-2014. When the emblem is down into the material or embossed then I call it hot stamped. 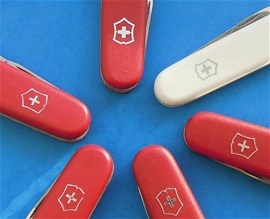 This is because Victorinox used this type of method, there are maybe other methods used today I do not know yet. The only emblem on the picture that is not hot stamped is the one on the top to the right. This is just a color print on top. The evolution is difficult to see without having it in the hand. What I can see is the cross itself are more slim before 2007 and the top section is a bit more flat in the design details before the notch on the screwdriver arrived 1999-2001. I would expect more variations, some of the knives are advertising knives and it seems the evolution is regardless of this. I will see. 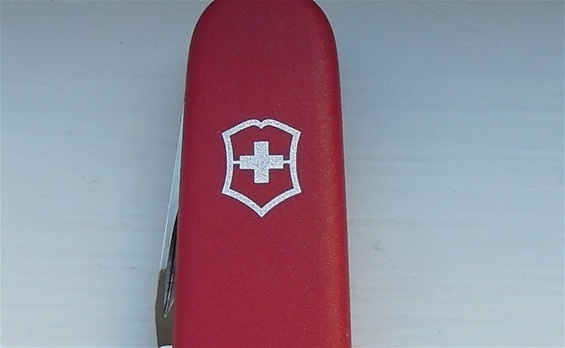 In 2010 i received information from Victorinox that confirms the use of hot stamp method in production. This you will find on the 1977,1979-1994 types as well. The latest variation on the cross and shield with depicted lines got some interesting changes but i would believe the method is a hot stamp as well. The color is silver. About the advertising knives: I know and can see that the functions and evolution may not always follow the regular dates. I have seen some variations on the type of emblem and methods on them. I would recommend having advertising economy made or EcoLine with some here too. In general it is not needed. I suspect the use of print emblem and hot stamp linked with advertising and identification on the knives. On the picture to the right is a mix of hot stamped and printed emblems 1994-today. All are in silver color. The white one is a printed emblem in silver color as well and it is a advertising knife. It is a 84mm category and this category is different. On this picture on the right you can see garden knives. Only the red are economy made. The two on top got a printed emblem so then we can say Victorinox use printed on both categories. The other knives are hot stamped and we see the same depicted lines information. 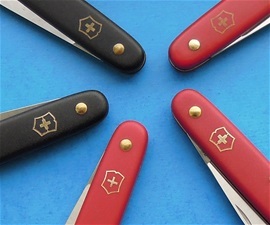 Victorinox use gold color and use hot stamp on both regular and economy made knives Most of these knives are advertising knives so please grab the field for research! here is a better picture of the depicted lines from the cross type(Down into the material) on a knife from 2013. It does show some changes on the bottom part, it shows production variations and it does tell me something changed in the production on this type.